While reading through the Ball® Complete Book of Home Preservation recently, I came upon a variety of pectin-free jam recipes. Instead of pectin for thickening, these recipes used homemade applesauce made from whole, uncored, unpeeled apples and whole unpeeled lemons. The high amount of natural pectin in these two fruits thickens the jam naturally. Additionally, using the homemade applesauce as a base helps to extend your other fruit - be it plums, cherries, berries, peaches, or the like - much further, allowing you to make more jam with less of this other fruit. I was totally intrigued, and liked the idea of not needing pectin to thicken the jam. Sure, I love my Pamona's Pectin dearly, but wouldn't it be nice to take a break? The recipes looked easy to adapt to include unrefined sweetener instead of cane sugar, and I had all the ingredients on hand. So, I whipped up a batch of jam with apples, plums and a bit of ginger, sweetened with agave nectar. It turned out marvelously. The jam is soft and spreadable, but still thick enough to mound on the end of a spoon. The color is fantastic, and the flavor is sweet and bright. I knew immediately I had to share it with you! 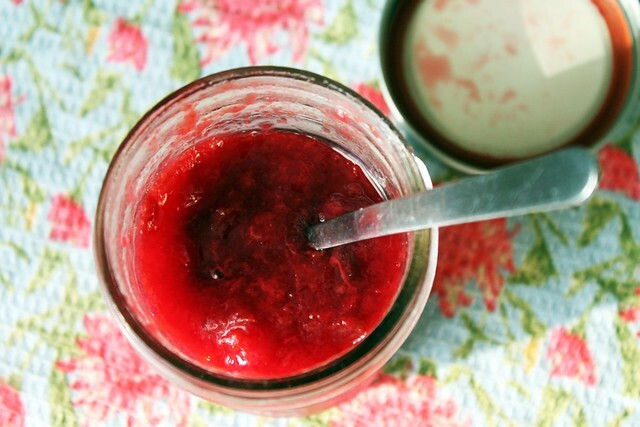 This plum jam is made with unrefined sweetener and homemade applesauce. The applesauce is made with unpeeled apples and lemons, which are both loaded in natural pectin, and then is strained before combining with the plums. The result is a naturally thick, sweet jam that does not require the addition of pectin and is much lower in sugar than conventionally prepared jams. This jam is simple to prepare and is affordable to make. 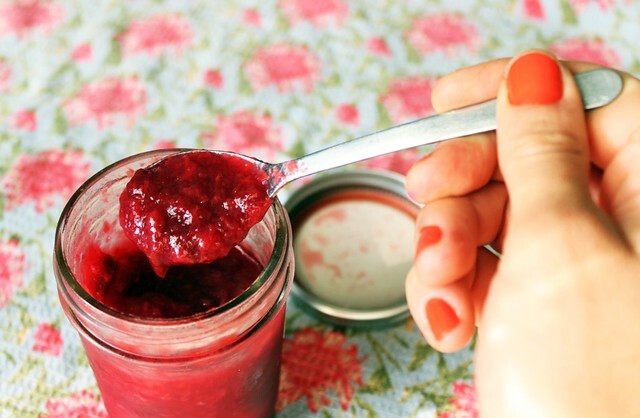 Jam is a great thing to have on-hand for easy contributions to brunches or as a lovely gift! Remove stem and blossom ends from apple, and coarsely chop. Prepare ginger root and lemon, and place in a large, tall pot with enough water to eliminate sticking. Don't be alarmed by all the seeds, pith, and skins - this it is all high in natural pectin and will help thicken the jam! You will be straining all of the chunky stuff out before using it. Bring apple mixture to a boil, cover, and reduce heat and simmer until apples are very soft, about 20-25 minutes, stirring often. Remove from heat and run mixture through a food mill, or scoop small amounts into a fine mesh strainer positioned over a bowl and push apple mixture through the holes with the back of a spoon (scrape out skins/seeds often and work in batches). Reserve two cups of the fresh applesauce, and place leftovers in the fridge to eat on its own or use in other recipes. Discard seeds/skins. Prepare boiling water canner by filling with enough water to cover jars by 1-2 inches. Place over high heat and bring to a boil. Wash jars and lids with hot, soapy water, and place in a bowl of hot water (NOT boiling) until you are ready to fill them. I often like to fill a teapot with water and bring to a boil, just in case I find I need more water for my canner once I fill with jars. Remove jars from hot water, drain, and place on a kitchen towel. Ladle jam into hot jars, leaving 1/4-inch headspace. Remove bubbles with a chopstick or small spatula by running around the sides of the jar, then adjust headspace if necessary, and wipe rims with a clean damp cloth. Apply lid and screw on band finger-tight. Lower jars into boiling water canner, making sure that jars are covered by 1-2 inches of water. Add more boiling water as necessary, and cover with lid. Once water has returning to a rolling boil, start timing and process 10 minutes (increase 5 minutes for every 1,000 feet of elevation). Once time is up, shut off heat, let sit in canner for 5 minutes, and transfer jars to a double thickness of towel placed 1-inch apart. Do not tip jars or wipe dry - water will evaporate. Let sit undisturbed for 12-24 hours, away from drafts. Then check seals - the tops of the jars should dip in the middle, and not bounce back when you press down with your fingers. If jars are well-sealed, wipe them clean, label, and store in a cool, dark place. Consume with in 1 year. Jars that did not seal should be refrigerated and contents consumed. Eat open jams within 3 weeks. Spiced Jam - feel free to add your favorite spices, such as nutmeg, cinnamon, or cardamom. Start with a small amount and add gradually, tasting as you go. Other fruit jams - use this same basic technique and substitute an equal amount of other fruit for the plums, such as peaches, cherries, raspberries, blueberries, or pluots. This recipe is linked to Slightly Indulgent Tuesday on Simply Sugar & Gluten-Free.